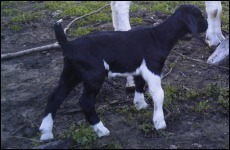 Fullblood Boer doeling, sired by our buck Jokers Wild. She will be staying here to add to our Fullblood herd. This doe is about 78% Boer and 22% Kiko. Sired by Joker also. She is a keeper too. 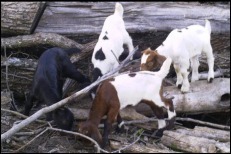 Four young doelings must have found something interesting under that log. This red percentage Boer doeling takes her first nap in the sun after being born. A newborn percentage Boer doeling takes her first drink of mom's milk. Our does are all good mothers to their kids.